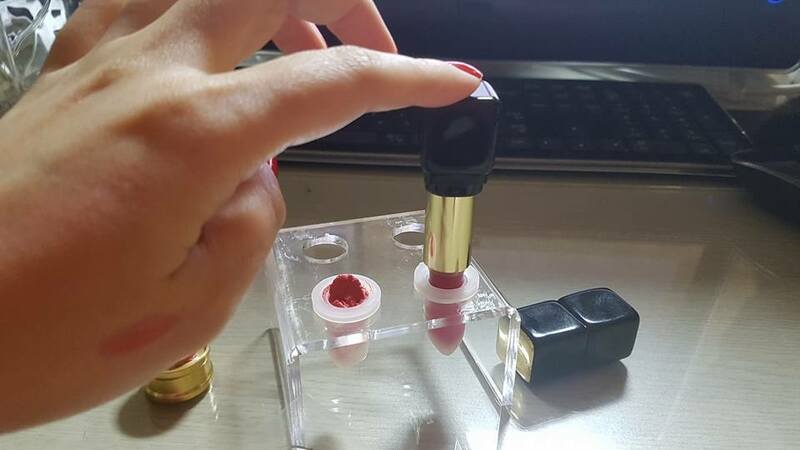 Dressing My Truth Blog by Jessica FlatShoenista: Make Your Own Lipsticks -- With a Silicone Lipstick Mould-!! 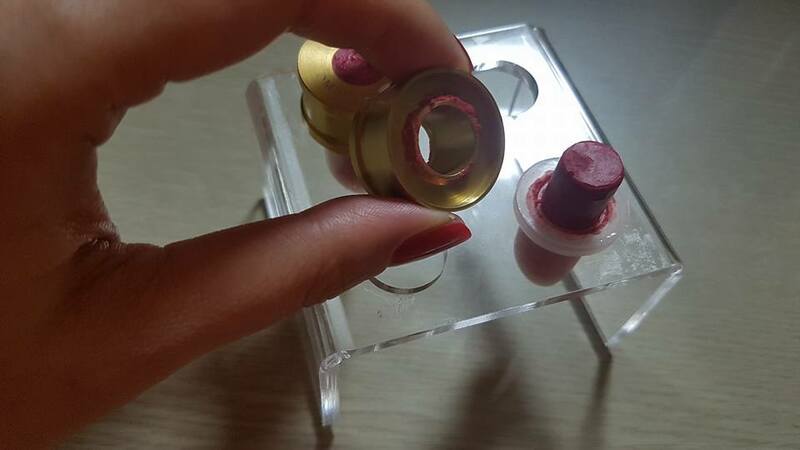 Make Your Own Lipsticks -- With a Silicone Lipstick Mould-!! 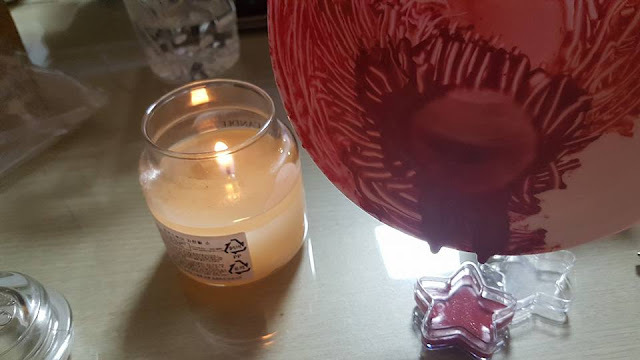 Today, I want to share with you my new exciting project! 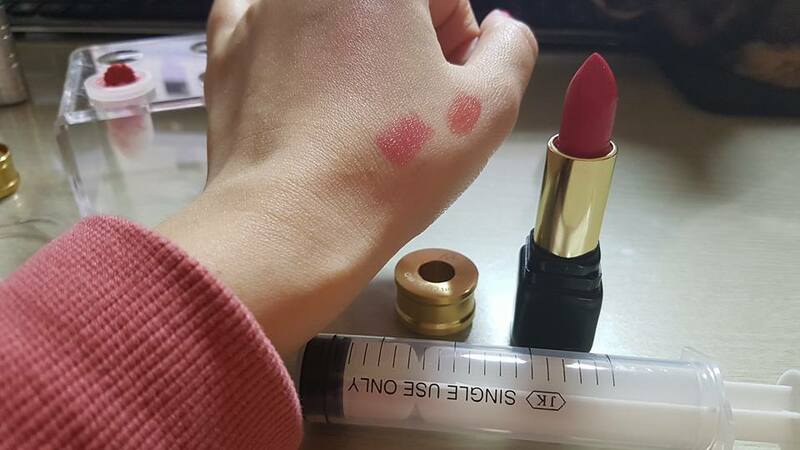 I have two lipsticks I absolutely love and used to the end. 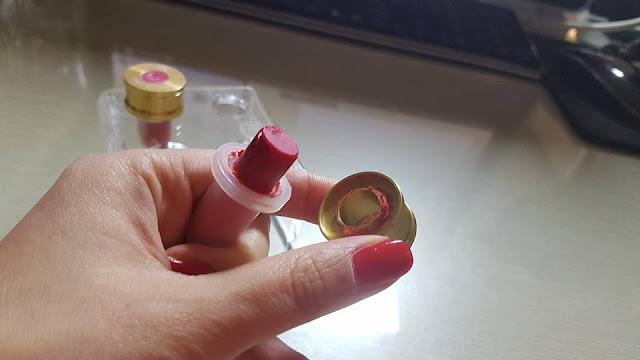 I don't like using a lip brush, so I really wanted to make the leftover bit sitting inside the bottom bit into a new lipstick. 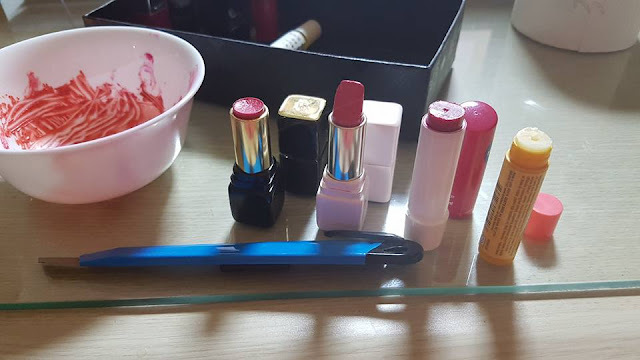 I am a clear spring, tinted spring, bright spring, and Guerlain Kiss Kiss Red Love 324 and Clinique 10 Coral Crush work wonders on me! So what you need next is the lipstick mould and a plastic holder. A heat source and a small bowl. 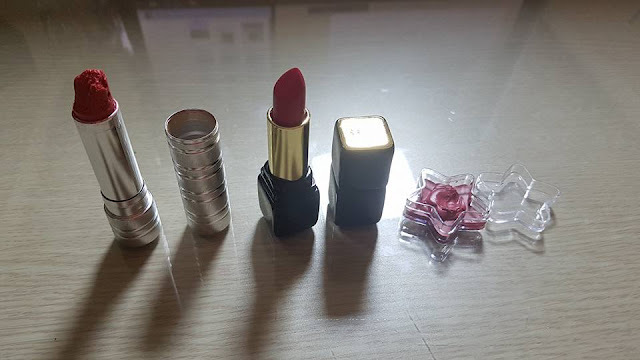 I bought 2 lipstick moulds and a holder with 4 holes. 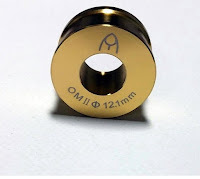 The place I bought them from also have a holder that holds 1 mould, but from the reviews I could see that it would be better to go with the 4 holes so I could make more than just one. I wish I had a smaller bowl but I could only find my rice bowl for now. 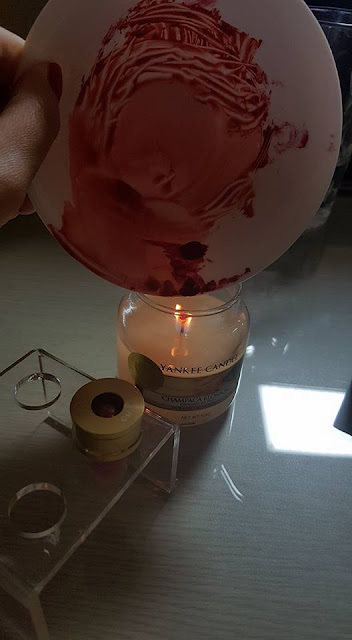 And I used my scented candle as a heat source. I've seen other people who used a hot plate which is more professional, as well as using a paper cup in a microwave. 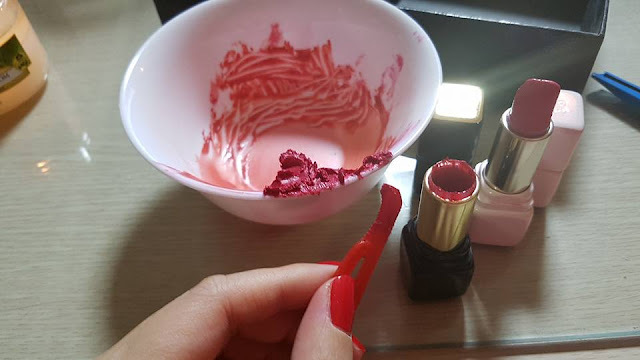 I made the mistake of melting too little lipstick in my first trial... and it ended up disastrous! 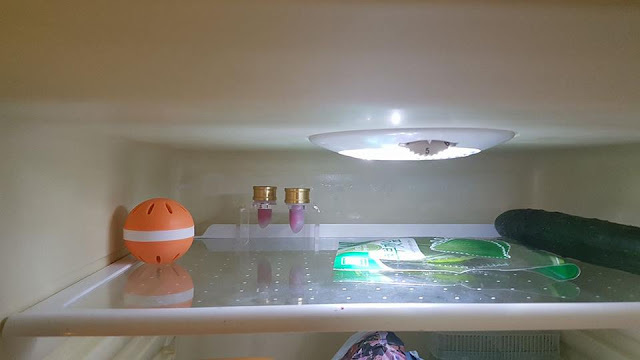 I ended up having some gaps... so make sure you melt more than you think you need! Pouring everything in one go gives you a much better result! Here is the melting again... 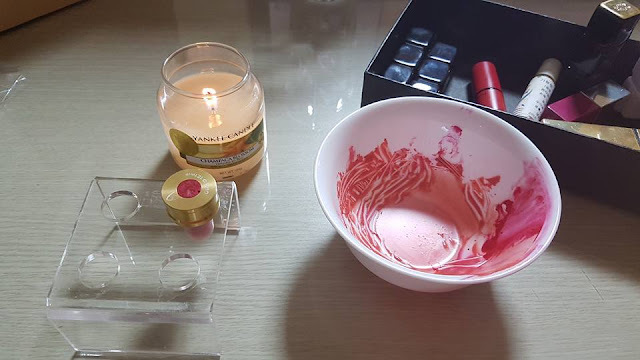 I found that melting the lippies at the midway point of the bowl was much more efficient than doing it at the bottom of the bowl! 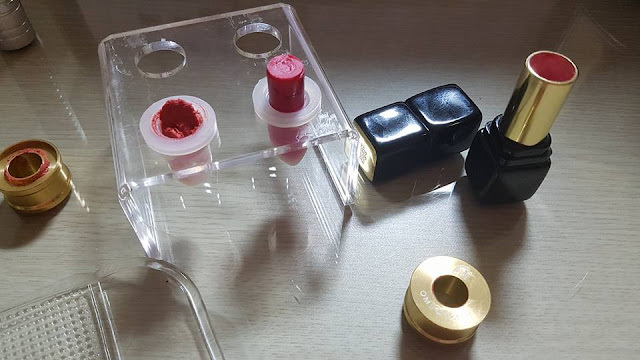 Just so you know... the lipstick mould is made of two parts. 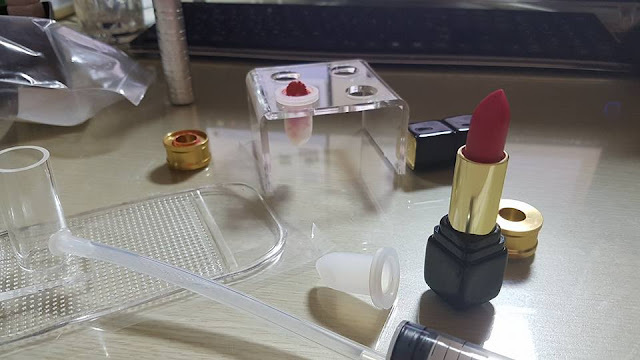 You need both to make your lippie! 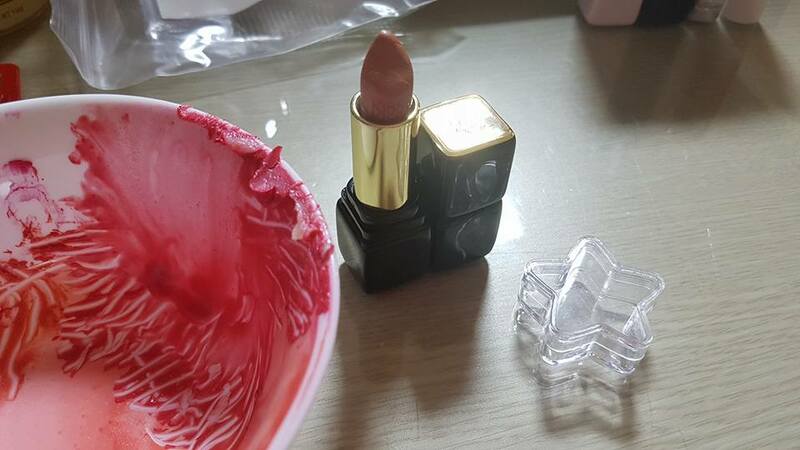 Once you finish pouring the melted lippies into the mould, it's time to put them into your fridge for cooling! It takes about 30 minutes they say... So, let me go check in on them! And they look ready... for the magical last step! 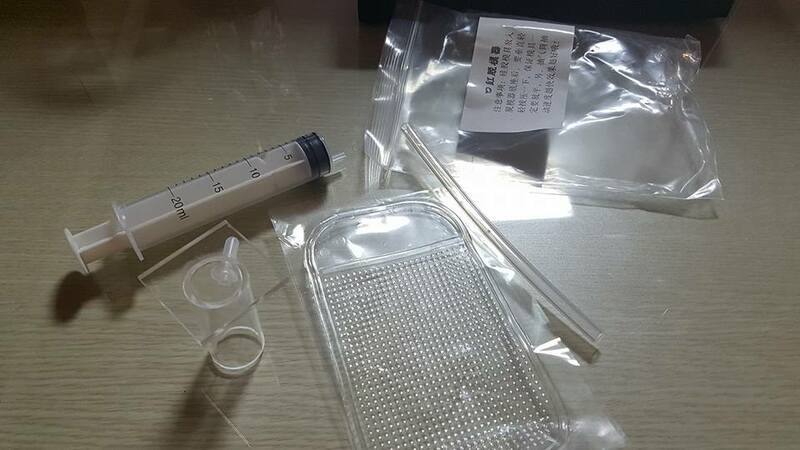 The last part requires an air pump device... Without it, you run the risk of ruining your lippie... because putting the lipstick into the casing is a bit tricky! OK! So, here comes Part Two! 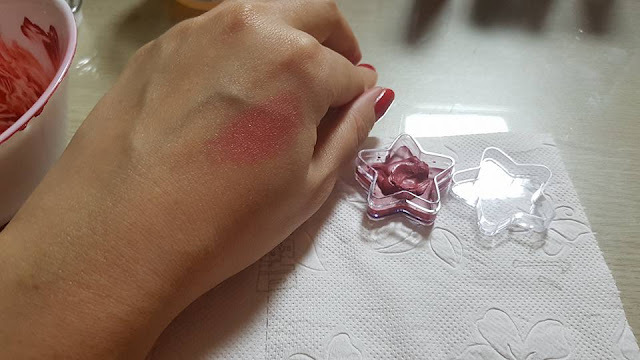 The lippies are no longer creamy! 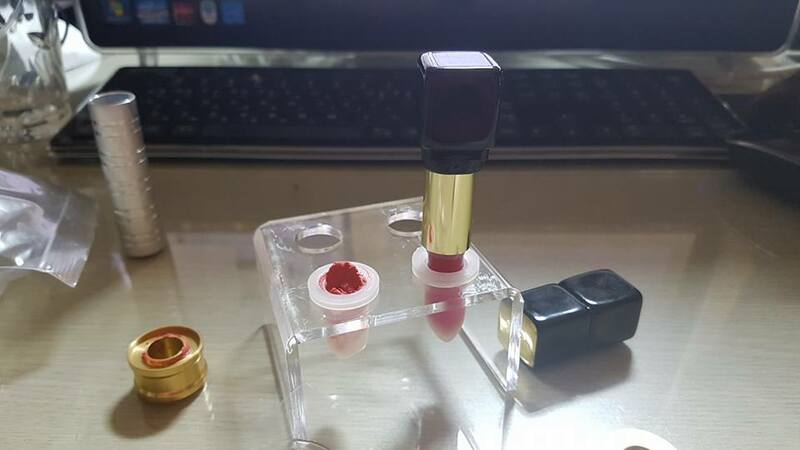 Next, pull off the golden cap! As I mentioned above... melting the lippies in small doses will create this messiness!! 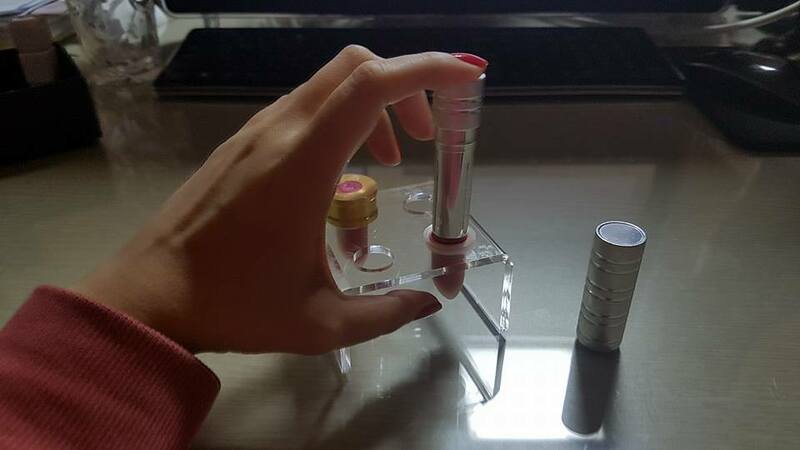 Next, you put the empty or new lipstick case right above the lipstick, holding it perpendicular... It will slide right in if you gently press down on it. Then, setup your air pump device like the picture below... with the lipstick case sitting on top of the cylinder... air chamber? 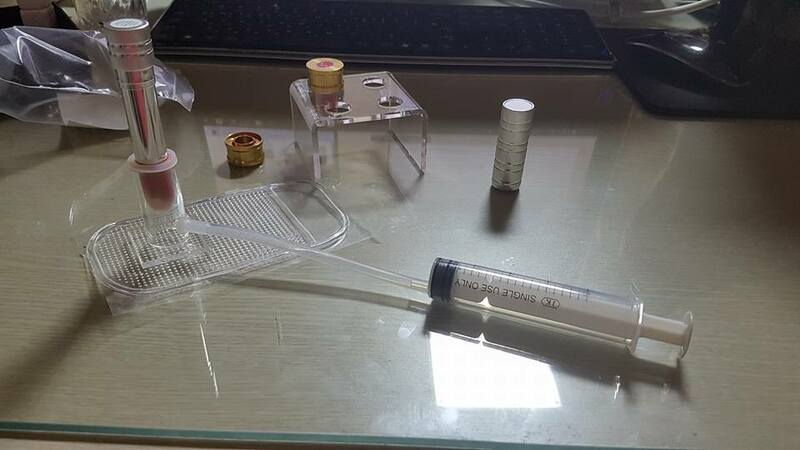 :) Start with the syringe at the bottom. Then slowly pull the piston out... Then slowly push it back in. 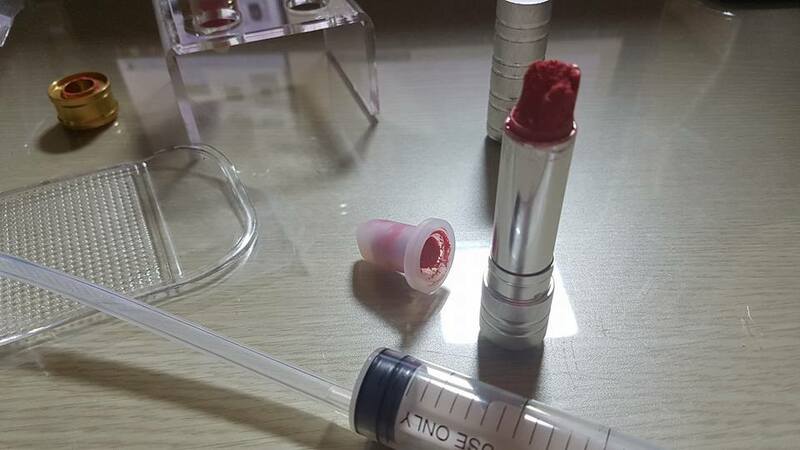 This will help the lipstick loosen up from the silicone mould!!!!! Yes! It's a nice coral sheer lippie!! 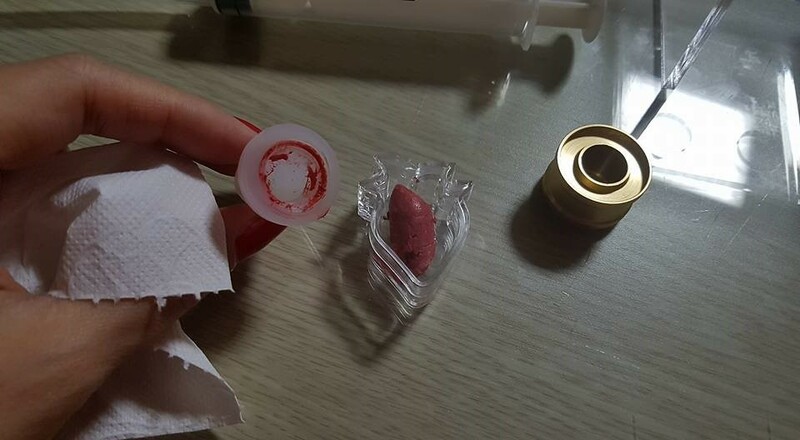 Just what I wanted~~!! I put away the piece that was broken in a mini casing for next time... See you little chap!! OK! Let's show you my SUCCESSFUL trial!! Can you see how gorgeous and shiny brand new it looks?!!!! Yippeeeeeeee~~!!!!! So... yup! My second trial was a total success! I cut in bigger chunks of my lipstick, to make sure I had enough... And as you can see this turned out perfectly!! It's the color on the left... 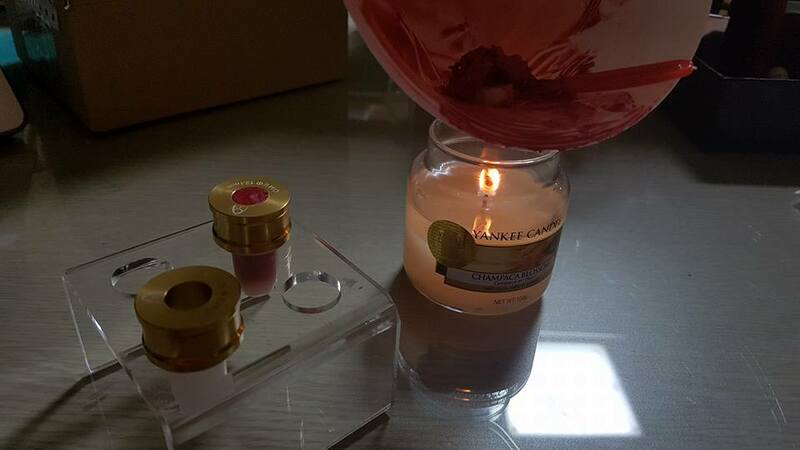 It's a really nice rosy pink glow~~!! I knew I would have some leftovers... So I ordered the mini casing just in case. 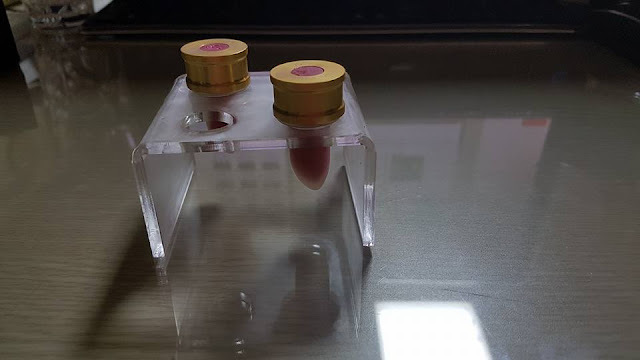 Initially, I wanted to make a cheek stain from it... but the color didn't work out and neither did the amount required... 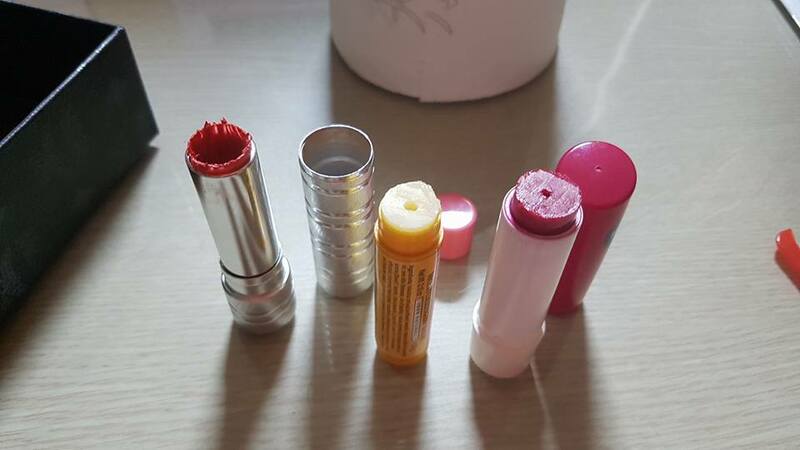 Seriously, you DO NEED a lot of lip product to fill these things up!!!!! So, I ended up mixing my Guerlain 300 Golden Girl and MAC Matte Lipstick Hot Pepper and the last bits of my chapsticks... Those two lipsticks were the ones I never use... so it was cool I could find a way to make them work for me!! That is all I can share for tonight!! 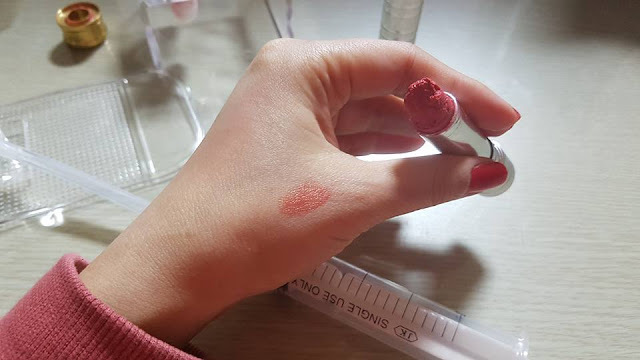 Thanks for reading & I hope you can have fun with recycling your lippies too! !